I took the work SIM out of the iPhone and put it in my Nexus 4. This completely solved the problem of my other devices not being able to reliably connect to my iPhone. Everything can connect to my Nexus 4 and do it at the same time, without fail. This moves me on to the issue of the actual 3G connectivity. In Tauranga, where I have been for the past 2 days, the Vodafone 3G connectivity is relatively reliable.....but slow. Typically, I max out at about 110KB/second peak...the average throughput is between 70KB and 80KB/sec. That's about double the speed of a dial-up modem. The problem is that it's not fast enough to allow me to use my Bomgar remote software to realiably connect to any of the systems I need to work on. If I manage to get connected at all, I soon time out....and have to re-connect....IF I can reconnect. That often times out, too. Now....sitting in exactly the same place (again - different city, same local context for me...and same problem) I get out my personal phone (SGS4 on Telecom) and connect to its wifi. Telecom don't have LTE in Tauranga....so it's 3G vs 3G. I am able to connect reliably to the SGS4 for wifi. (Same as the Nexus 4). The BIG difference is the throughput rate. I can easily and reliably get to about 576KB / sec throughput (seems to be about the max) and I can sustain that - or close to it - for extended periods. This means I can connect to the Bomgar server. I means I can then connect to the client system. It means I can connect to MULTIPLE client systems. If this was a one-off, it wouldn't be huge deal....coverage varies. But I'm seeing this consistently everywhere I go. In Christchurch. Around Auckland (prior to Telecom LTE launch - haven't actually seen that yet on my phone)....and now in Tauranga. I'm not posting this to be an arse.....I'm posting it because I want to know if other people are seeing this too if they have immediate, ready access to both data networks for performing the same functions. I guess a better test would be 2 x SGS4...but the Nexus 4 has been utterly fast reliable on the 2Degrees (theirs) network nodes I live and work near. It's the Vodafone parts that (almost reliably) fail to perform to expectations.....on my collection phones. They can't all be duds. I live in Tauranga and use an iPhone 5 and an iPad. I've had flawless coverage throughout the city. 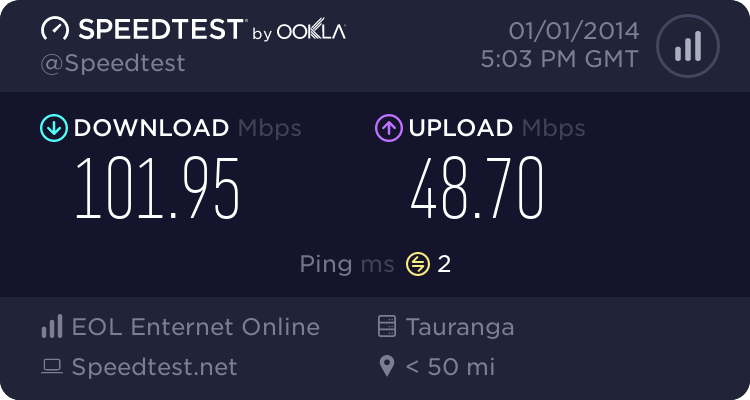 4G is working in some parts of Tauranga, Mt Maunganui and Papamoa. Vodafones 3G is exceptionally faster than Telecoms obviously due to Dual Carrier. I was told they're doing some Major Upgrades which could cause some disruptions? Where In Tauranga exactly are you using 3G? If you read some of my blog posts, I pointed out that Vodafone coverage is relatively poor compared to Telecom. This hasn't change over the last 2 years. One bar on Telecom let you go further than 2 bar on Vodafone. One thing that I didn't regret was paying close to $300 to break my contract so that I can port my number to Telecom after I moved here. I got out of a contract in Tauranga after signing to Vodafone and discovering the network was so poor. Hopefully the 4G launch changes it for the Vodafone customers here, but even challenger 2degrees has miles better 3G coverage than Vodafone here. I'm in Tauranga and don't have any problems with Vodafone 3G on my iPhone 4. Just did a speed test to confirm, and I got 3Mbps down. I also use remote access to other systems from time to time on 3G and performance is alright (latency could be better, but thats just 3g). Not sure why you had such bad luck. I don't just use it at home & "the office" too, my work requires I'm all over the place. I always found 3G in Tauranga on Vodafone good compared to their GSM coverage which was pathetic..
jsherborne: I live in Tauranga and use an iPhone 5 and an iPad. I've had flawless coverage throughout the city. 4G is working in some parts of Tauranga, Mt Maunganui and Papamoa. I was Willow St and in Greerton. Yeah, what he said. Thanks ;) Hoping it's a temporary network issue, not a handset issue! Can you get 3G coverage in Te Puna now?